“Do you remember that Kooch we got married right after?” Jamshid asked. “I should remember it because…” she replied. To get the point of this conversation, you really should know what “Kooch” is! But before we start to define Kooch, we first need to know who a nomad is. A nomad is someone who does not live in one determined place; they wander around to find a good place to live for a while before moving to another suitable spot. There are modern nomads who travel worldwide normally stemming from first world countries, but there are also still traditional nomads as well, who lead a very minimalist, yet fascinating life. Traditional nomads are from less developed countries roaming a part of their own country to find a seasonal spot to settle. Iran has different kinds of tribes such as Kurds, Lor, Balooch, Arabs, Guilaks and Turks. But there are the four most well-known nomadic tribes; Turkeman, Shahsevan, Bakhtiari, Qashqayi people. Turkmens: from the Turk tribe living near the Turkemenistan border in Golestan Province. They mainly take care of horses and camels as their livestock. Shahsevan: the term means “the ones who love Shah (king)”. 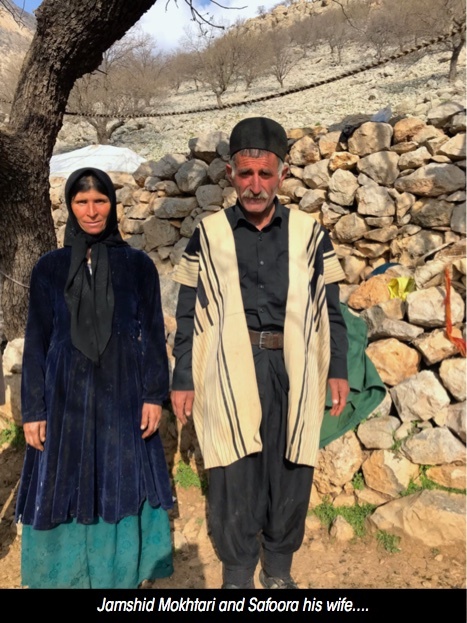 They live in the northwest of Iran, near the Azerbaijan border in Ardebil and East Azerbaijan Province. Bakhtiari: the term means “the ones who have the fortune with them”. They live in the Zagros Mountains in the west of Iran next to Isfahan Province in Chaharmahal & Bakhtiari Province. These nomads make up the largest nomadic tribe of Iran. Qashqayi: These people are also from the Turk tribe and speak Turkish. They live in Fars Province south of Iran. These people have now settled down in one pasture throughout the year. 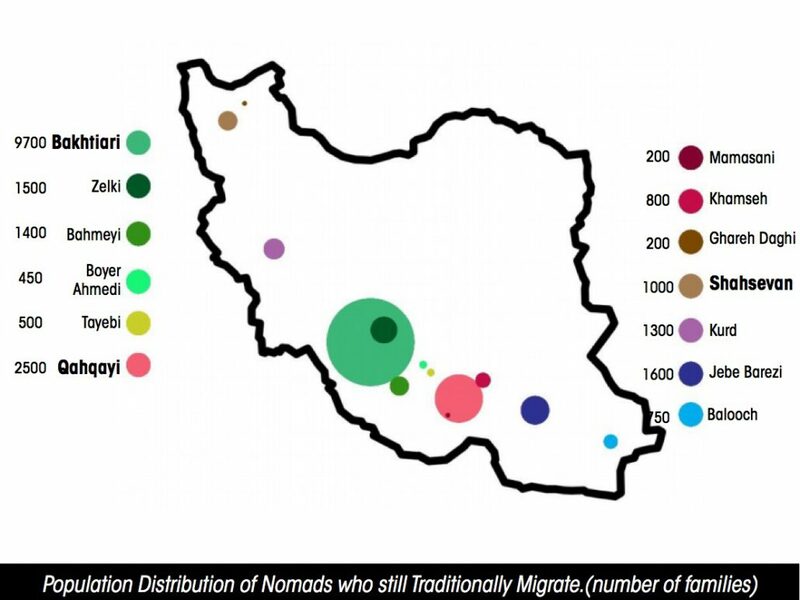 Sadly the number of nomads in Iran has dropped over the past century. They have mainly moved to the cities to start a modernized life. In 1918, the nomadic population was 50% of the country’s inhabitants. 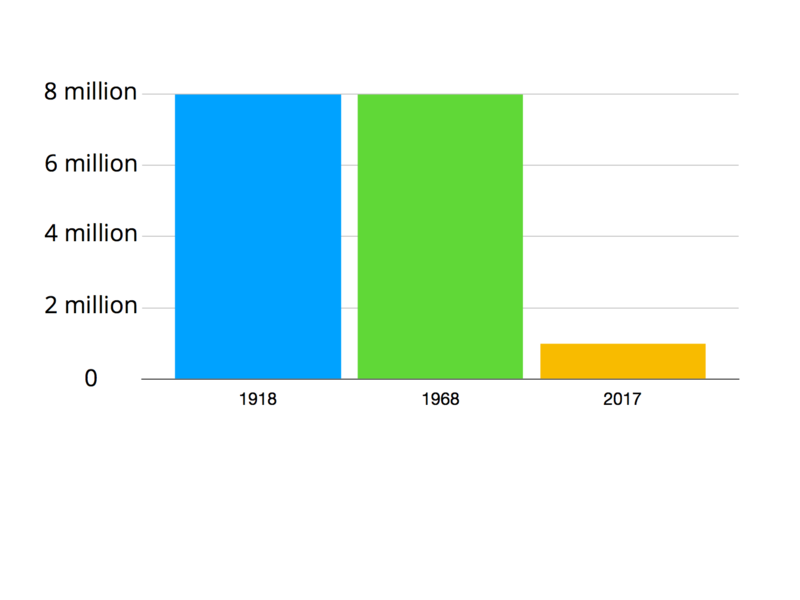 In 1968, it was only 25%, and in 2017, it dropped to between only 1-2% of the country’s population. Shahsevans are completely settled in villages nowadays. 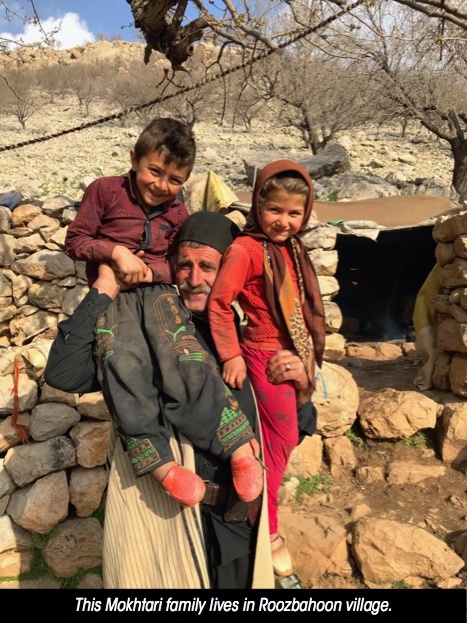 Turkmens and Qashqayi people rarely migrate and 90% of them have been settled in one place, either in their tents or villages nearby. Among these nomadic tribes, the Bakhtiari are the ones who have the highest population. Plus, they actually migrate with their livestock. 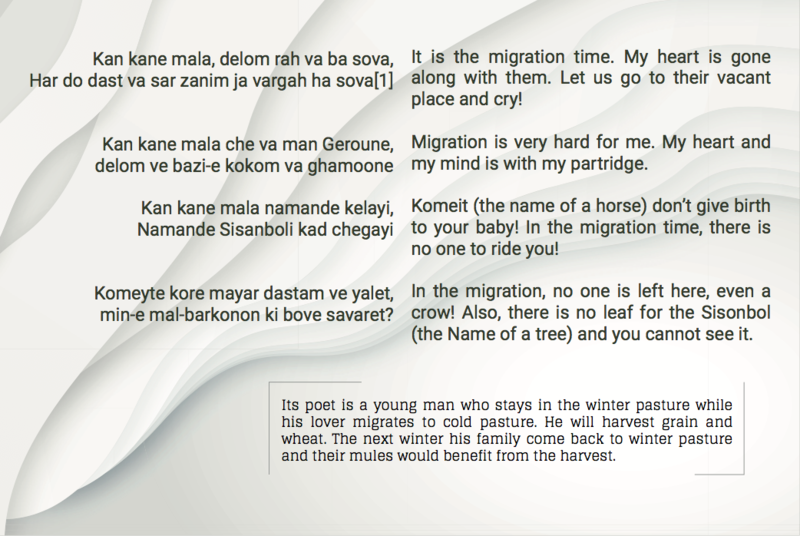 In the Bakhtiari dialect, this up to 500 km migration is called “Kooch” or “mal be rah” or “nomadic migration”. So when we were talking about nomads who are settled in villages or tents, in fact, these tribes have abandoned the Kooch. The Kooch is the name of the migration festival; they celebrate moving to another pasture in search of suitable grassland for their sheep and goats. 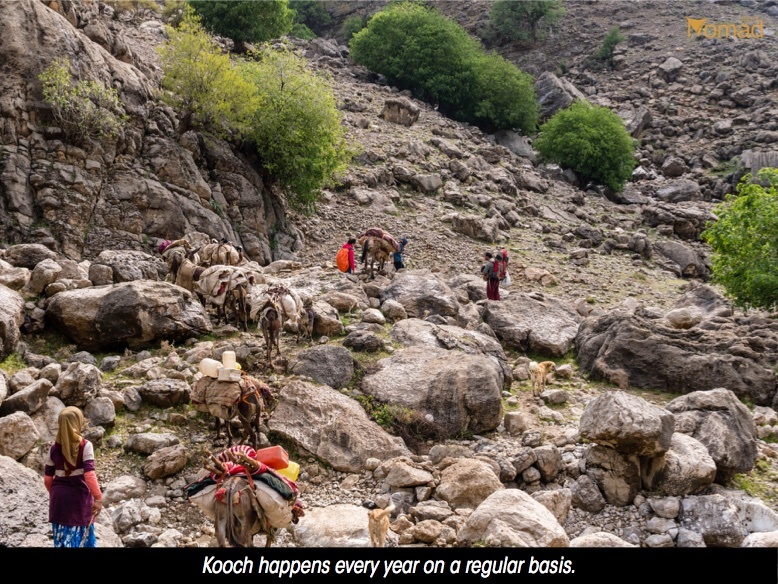 The Kooch is typical among the nomads, and it happens every year on a regular basis. Each family takes the same route each year, and they have their own summer pastures in which no other family can stay. The next year again, they set up their tents in the same spot. Those who have big flocks are the wealthy ones who have more facilities while they are migrating, and usually, they choose the longer routes. By contrast, the less fortunate ones often postpone their migration, and they choose the shorter routes. This journey can take anywhere from one to six weeks. As there are no facilities on the journey, each family carries everything it needs for up to two months. The timing of this journey is incredibly important as the tribe must decide to leave late enough for the ice to have melted to allow a safe passage but early enough to arrive in the green plains before the plains have been overgrazed by other animals. Bakhtiari territory, known as ‘Bakhtiari Land’, is located in an area between Isfahan and Khuzestan. Zagros ranges pass through their land, diving it into two geographical regions; mountainous regions in the East, and plains in the West. The mountainous regions are the Bakhtiari summer pastures, and the plains and valleys are their winter pastures. Estimations says that they are around 500,000 people, living in this area. 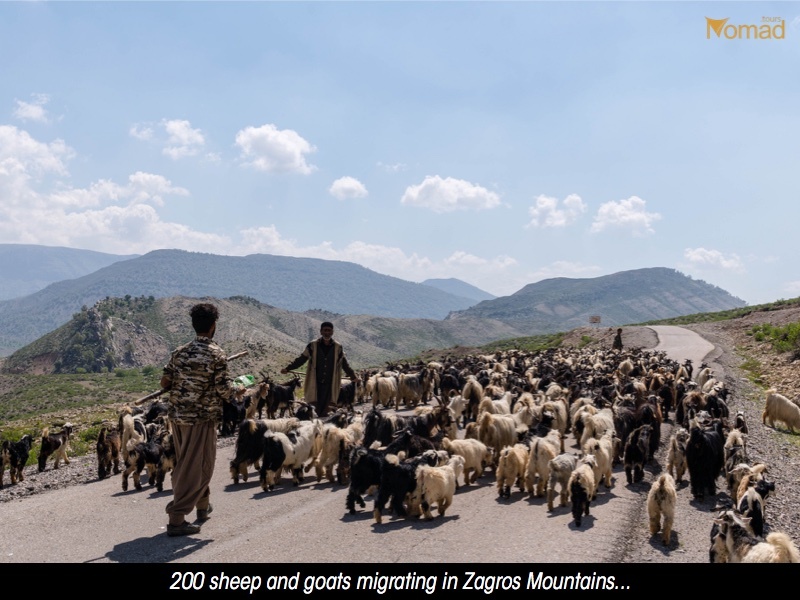 40% of them (200,000) are nomads and semi-nomads who move between summer and winter pastures. They are herdsmen with herds of sheep and goats. Their summer pastures are in Isfahan’s western highlands. 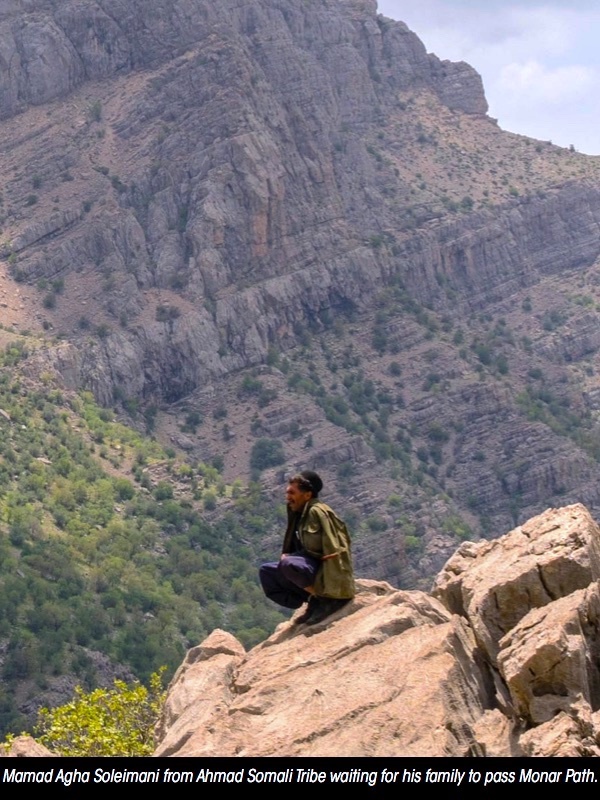 The highest mountain in the area is 4549 m. The winter pastures are in the eastern areas of the Zagros ranges and spread into some parts of Khuzestan province. Each day, their journey begins at dawn, with a long train of people and animals walking through the narrow passes of the hills and mountains. Sometimes you need to cross large rivers and carefully guide the entire flock of sheep through the rushing current. If it rains, the nomads have to stop and wait for it to pass. If their tents get wet, they’ll have to wait for it to dry or it’ll be too heavy for the animals to carry. Can you imagine what happens when suddenly your donkey refuses to go any further? 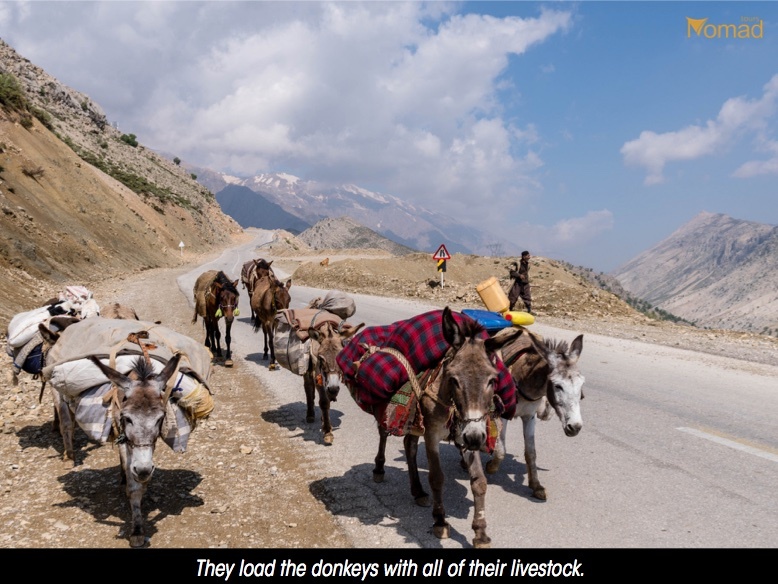 When these donkeys are carrying your home! Therefore, there has to be a strong connection between the animal and its owner. So, frequently, the needs of this large number of animals dictate the journey rather than the comfort of the tribe itself. As the day draws to a close, the many families pitch their tents to recreate a small village or mal. So inspiring and brave is this journey that in the 1920s, Grass, one of the first ethnographic films, followed this difficult trek. As risky as this journey is, it’s a necessary method of surviving the cold snowy temperatures of the Yehlag and the hot dry season of the Garmsir. This is the inspiration behind the creation of Persia Nomad Tours. Intermarriage is very common among Nomads. They usually marry someone from their own tribes, tying the knot early at around fifteen. One of the reasons for this is the size of the family’s flock of sheep, because raising large flocks requires a larger number of people. They make their own clothing for the wedding parties, and have special ceremonies. They normally have weddings right after the Kooch, which is the most important feature of nomads life in Iran. And unlike Qashqayi nomads, the Bakhtiari have not abandoned the Kooch. The literature of the Bakhtiari tribe repeatedly reflects the Kooch. In the following, you can read a poem about the Kooch. The nomadic lifestyle is in a close relationship with nature. The poem obviously reflects nature. The man uses partridge as his lover’s nickname. He also uses the names of horse and tree. We establish that nature is the heart of their nomadic migration and lifestyle. Nomad name their animals based on their color. Komeit is the name of a horse with a red body and a black tail and a black mane. Partridge is an abundant species of Bakhtiari district. Translation: In the line of Monar, I took the ears of your cow [which you are riding on] to stop it. Then I put my hand around your neck and I kissed your eyes. Monar is one of the important gates in nomadic migration. This gate is a line in the mountains. As you see in the pictures below, the man is waiting to watch his family passing Monar. Only after they have passed it, will the poem’s hero return. 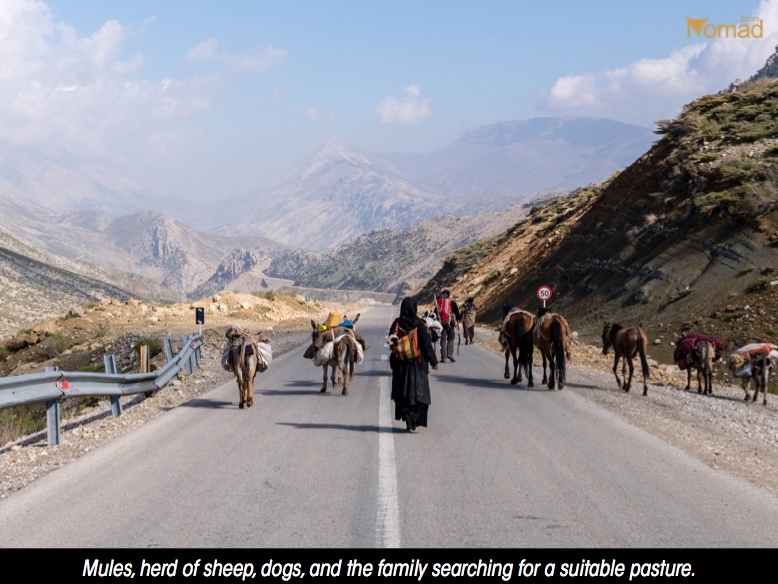 On NomadTours we will trek with a nomad family for 1, 2 or 3 days and we will pass this traditional Monar line in the Zagros ranges. So you, too, could be a part of this authentic adventure! work music, an article written by Jahangir Safari, Ebrahim Zaheri, two Iranian anthropologists, Farhang va Mardom quarterly journal, eighth year, autumn.